To be honest, I wasn't sure what I was going to review tonight. Have a bunch of new choices but wasn't feeling inspired. That was until I went to Total Wine and saw a new Dogfish Head glass that I really liked. And that made my decision very easy. 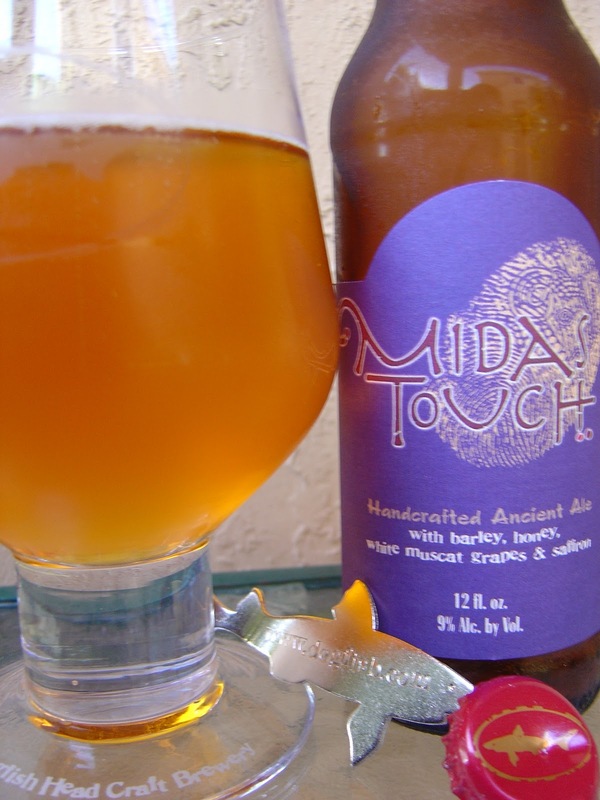 Tonight I'm drinking Midas Touch brewed by Dogfish Head Craft Brewery in Milton, Delaware. This will be the first time I drank this beer since reviewing it back in April, 2009. 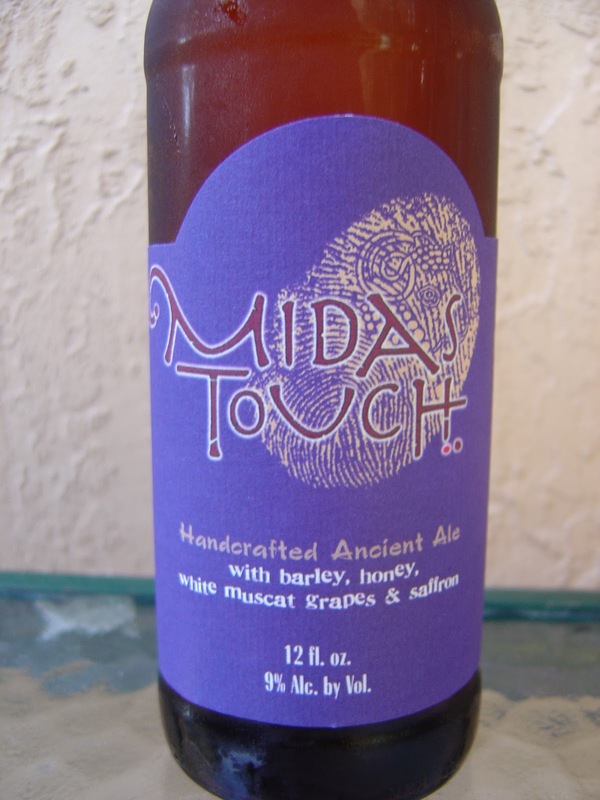 Simple, deep purple label says this is a "Handcrafted Ancient Ale with barley, honey, white muscat grapes and saffron". Bottled On: 07/27/10 D.
Honey, sweet fruity aroma. Honey sweet flavor start as well. Nice grape back-up with a warming burn from the 9% alcohol. Creamy smooth, lightly flat. Interesting spiciness, probably the saffron, though I need to go to the grocery store spice section to be sure. After a few sips, some other fruity complexities show up, like sweet orange and apple. You also start to feel the alcohol in your chest a bit more. Interesting, flavorful. Not my favorite and not even my favorite from Dogfish Head, but a very nice beer to try now and again. I love Dogfish Head Beers. I am drinking Dogfish Head 90 Minute IPA at this moment! Their beers are such a treat. Once you experience craft beer you never want any other! I actually really liked Midas Touch. Not something I'd sip on all day but definitely interesting. Supposedly brewed using the same ingredients they used back in the King Midas days. Hello Bajuna Jewelry. Nice to meet you today. Dogfish is definitely an awesome brewery! "This recipe is the actual oldest-known fermented beverage in the world! It is an ancient Turkish recipe using the original ingredients from the 2700 year old drinking vessels discovered in the tomb of King Midas. 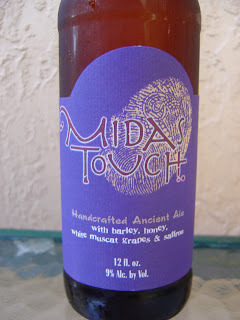 Somewhere between wine & mead; this smooth, sweet, yet dry ale will please the Chardonnay of beer drinker alike." Mike. I wasn't trying in any way to say I didn't like it. Great and interesting flavors. It's just that this brewery has a reputation and I like others they do more. You should for sure try it. And glad that Ed egged me on and you found that part interesting.